Labor leader Bill Shorten has described his ‘Cancer package’ as the most popular policy announcement he has ever made. The centrepiece of the package is the $2.3 billion (over four years) strategy announced in his Budget-in-reply speech which aims to reduce out-of-pocket treatment costs for cancer patients. Subsequent to the Budget-in-reply speech, Labor has announced some additional cancer initiatives, including an additional $55.7 million for specialist cancer nurses, funding for regional cancer centres and a $37.7 million package for programs supporting children and young people with cancer. As Croakey reported last week, Labor’s funding commitment was favourably received by both stakeholders and the community, with the AHHA describing the policy as a ‘gamechanger’ and CHF calling it ‘a tremendous step’. Below, Jennifer Doggett discusses the short and longer term implications of Labor’s cancer strategy and raises some questions about its implementation. Together, these measures will inject over half a billion dollars extra funding a year into the health system, across these areas of cancer services, support and research. Clearly the most direct beneficiaries of this package will be people with cancer. Cancer care is an area of health care in which people often incur high out-of-pocket costs (OOPs) relating to their treatment. This was clear in recent research undertaken by the Consumers Health Forum of Australia which documented the OOPs incurred by health care consumers. In fact, CHF’s Out of Pocket Pain report states that over a quarter of all respondents with cancer had spent more than $10 000 on treatment in the past two years. Cancer is also an area of great inequity in the costs incurred by consumers. Depending on their location, type of cancer and sometimes provider, consumers can face widely different OOPs with some receiving treatment free, or at minimal cost, while others, even those with the same diagnosis, face tens of thousands of dollars in fees and charges. Lowering the cost burden overall for people with cancer and addressing the inequities that exist between cancer patients is a major positive of the Labor policy. However, this policy has significance beyond the direct benefits it will provide to cancer patients. 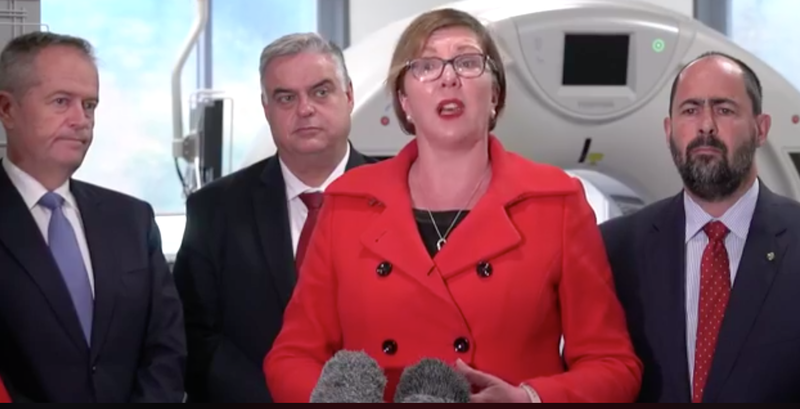 Labor’s commitment to addressing cancer OOPs recognises that OOPs are a major, widespread and systemic feature of our health system which requires intervention by governments. Part of the problem with OOPs has been a reluctance on the part of successive governments to take any responsibility for the problems high health care costs cause to consumers and the barriers they create to accessing care. Despite the fact that OOPs are the third largest source of health funding (after Federal and State/Territory governments) and contribute more than double the amount to the health budget as does private health insurance (PHI), until recently OOPs have been a virtual policy vacuum. Even when the current Government finally attempted to take some action on this issue, it did so in a way that treated OOPs as a problem to be addressed at an individual consumer, rather than a policy level. The year-long investigation of the issue by the Ministerial Advisory Committee on Out-of-Pocket costs focussed almost exclusively on a small number of specialists charging very high fees. This approach ignored the clear message from consumers that the OOP burden was much more complex than a handful of overcharging specialists and was more frequently the result of the cumulative impact of relatively small costs over time, rather than a single high cost for one service or procedure. The Committee’s narrow focus limited its proposed solutions to a ‘fee disclosure’ website (and associated information campaign) to inform consumers of medical specialist fees and encourage them to shop around for lower cost services if they wished to avoid high OOPs. This provider-centric approach left responsibility for minimising OOPs in the hands of individual consumers, ignoring the role that the government could play in influencing these costs. Labor’s policy, on the other hand, hands government some responsibility for reducing the overall cost burden of health care. While currently Labor’s policy applies only applies to cancer treatments, it establishes a principle that the government has a role in overseeing OOPs in the health system. This has implications beyond the direct impact of the cancer package to potentially affect all OOPs faced by health consumers. Labor’s policy is also a strong statement of support for the public health system and an acknowledgement that solutions to the affordability of health care need to be found within Medicare and the public health system, rather than handed over to private health insurance (PHI) and the private sector. In fact, Bill Shorten barely mentioned PHI in announcing the funding commitments, beyond a comment by at the Launceston press conference that PHI does not cover many of the OOPs faced by people with cancer. Unlike the Coalition’s focus on PHI as the solution to problems with the growing cost of health care, Labor’s policy recognises the limitations of PHI in addressing OOPs and managing rising health care costs. This reflects the original vision for Medicare as a universal insurer providing full coverage for medical services. Over time, the Medicare rebate for specialist services has not kept pace with fee growth and for many services the rebate now functions as a partial subsidy of the total cost. Labor’s policy commitment restores the concept that Medicare should fund the total (reasonable) cost of outpatient specialist care. Other positives of Labor’s proposal include its strong focus on delivering services to rural and regional communities. We know that people living outside of major cities have poorer access to cancer treatment and worse treatment outcomes. In fact, the Australian Institute of Health and Welfare has found that compared with people in major cities, people in remote areas are 15% more likely to be diagnosed and 24% more likely to die from cancer. Labor’s package explicitly acknowledges the need to increase access to treatment and this will go some way towards reducing inequities in access to care between urban and rural areas. The package also recognises the important role of specialist nurses in improving care for people with serious diseases. Specialist nurses can bring experience, knowledge and practical skills that make a major difference to patients’ lives. However, they are a relatively new category of health professional and our existing workforce and funding structures were not designed to recognise and support these roles. Workforce reform, including strengthening the role of specialist nurses and other ‘intermediate’ health professionals, is important in order for the efficiency and overall performance of our health system. Labor’s acknowledgement of the important role of specialist nurses will help entrench their position and hopefully lead to further changes in this area. Of course as it stands, Labor’s cancer package is limited. It is not a systemic solution to OOPs and leaves many of the areas of greatest concern to consumers untouched. For example, OOPs associated with dental services are a major barrier to accessing care. Recent research by AIHW foundthat one third of people delayed or avoided going to the dentist because of cost. Labor’s policy also privileges people with cancer over those with other serious conditions. The choice of cancer as a focus for Labor’s pre-election policy is smart politics – cancer is a condition that affects a large number of people and one that all Australians can relate to – but it doesn’t make much logical sense. In announcing the package, Bill Shorten described cancer as “isolating and exhausting,” but this description could be just as easily applied to any life-threatening and debilitating condition, such as schizophrenia, end stage renal failure cystic fibrosis or motor neurone disease. Of course, consumers with these and other serious diseases are just as deserving of support for the OOPs they face as are people with cancer. One disadvantage of Labor’s policy is that it presents one group of health consumers – those with cancer – as somehow more deserving of support than others. This might level the playing field for people with cancer but introduces inequities between people with cancer and other diseases. While there are already inconsistencies in the cost and availability of health care services within our health system, this policy intentionally creates additional divisions. From an equity perspective, the money being spent on this package would be better spent providing benefits to all consumers incurring OOPs or in targeting those with the greatest problems affording care, rather than those with a specific condition. Alternatively, it could have been used to target specialty areas where consumers are most likely to face OOPs. For example, geriatrics, which has one of the lowest average bulkbilling rates of any non-procedural specialty. Focussing on cancer might be smart politics but by targeting a specific disease and patient group, Labor’s package undermines the equity and universality of Medicare. Another issue raised by some commentators is that the policy focuses too much on treatment for people with cancer and ignores the role of prevention. While the additional resources for treatment are welcome, the policy as a whole ignores the importance of preventing the occurrence of cancer in the first place, which the Cancer Council estimates is possible in around one third of cases. In particular, the policy does not address key risk factors for cancer, such as the rising rate of overweight and obesity. It also ignores secondary prevention, including the low rate of participationin cancer screening programs and the potential to improve cancer outcomes through improvements in this area. Shadow Minister, Catherine King, has flagged that prevention is on Labor’s agenda so this issue is likely to be addressed through other policy announcements during the election campaign. In addition to the above issues, the policy may face some implementation challenges, specifically in relation to avoiding the potential for cost blow-outs, over-servicing and fee inflation. Diagnostic imaging is an area with potential for over-servicing, due partly to the high capital costs but relatively low transactional costs involved in providing scans. Governments in the past have run into trouble in this area (e.g. the ‘scan scam’ of the late 1990s) and reports on Friday that the share price of imaging companies had risen in response to the Labor announcement indicates that the market anticipates the policy will result in significant increases in demand. One challenge here will be to ensure that this increase reflects the provision of evidence-based services and that the additional funding is not used to support over-servicing by providers. The specialist bulkbilling incentive may also present implementation challenges. Shorten has stated that the additional funding will only be available for services which are bulkbilled (currently around 55% of oncology consultations). For the policy to achieve its objectives, Labor needs a reasonable number of specialists, across all areas of the country, to accept the bulkbilling incentive. A partnership approach with the medical profession and consumers is critical to achieve these aims. He has not specified whether or not consumers would have a role in this group. So far the signs are positive that Labor has the medical profession onside. The AMA has said it is supportive of the policy and Royal Australasian College of Surgeons president John Batten is reported as saying he would “strongly advocate” for all members to sign up to Labor’s new Medicare item number. However, individual providers are not bound to follow the advice of their peak bodies and historically specialists have been a difficult group to work with on issues relating to fees. One issue working in Labor’s favour is the positive reception by the community of this policy. This will result in some pressure on specialists to participate and could potentially result in a more collaborative and evidence-based approach to medical fee setting in the future. The “depending on where they live” rider is important. The unavoidable OOPs to rural people needing to travel (and maybe stay over) are substantial but not counted in the stats about OOPs. As if to remind us of the seriousness of travel and accommodation barriers, there’s a story today about how NDIS clients also miss appointments due to travel costs and/or unavailability.